Fairfield Crystal provides component manufacturing for your most challenging designs and applications. 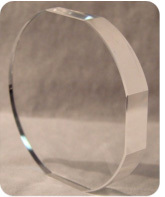 Combined with our expertise in crystal growth our component fabrication team is able to manufacture highly polished single crystal lenses, prisms, wedges, waveplates and other optical components to exacting specifications. We can also provide shaped blanks and generated parts to customers specifications, in addition to our precision polishing. We commonly process a wide variety of optical materials calcium fluoride, magnesium fluoride, barium fluoride, fused silica, most optical glasses, and IR materials, including zinc selenide and zinc sulfide. To ensure that the polished optic meets or exceeds customer specifications, each element is tested using state-of-the-art Zygo interferometers, hilger-watts autocollimators and custom laser scattering testing. Our crystals are also tested with our Perkin Elmer UV-VIS-NIR transmission systems and when required with precision stress birefringence testing. If additional optical testing is required we can also provide those services as requested.